Crash Course - "Episode 1"
So ABC’s latest summer reality venture, Crash Course, is sort of like Legends of the Hidden Temple but with cars going through the needlessly elaborate obstacle courses. So it’s like that show if Nickelodeon had ever gotten the OK to make that “kids drive cars!” show you KNOW it had to have had in development in the early ‘90s. Sadly, as promising as that sounds, it never quite manages to be as awesome as it could be, and what you’re left with is a show that makes that longtime TV staple – the car crash – into just another thing people are willing to do to win money. Part of this may stem from the fact that Crash Course’s first episode has one team that’s just head and shoulders above the other four teams its competing against. Team Siblings, for all of the weird sexual tension between the brother and sister duo that makes it up, pretty much aces every challenge put in front of it, while the other four teams are left to compete for the scraps Team Siblings leaves behind. To make matters worse, the two are supportive of each other, quietly do what they need to do and have a barely alluded to poignant back story about how they’re just a couple of kids from a small town with a big dream. Or something. 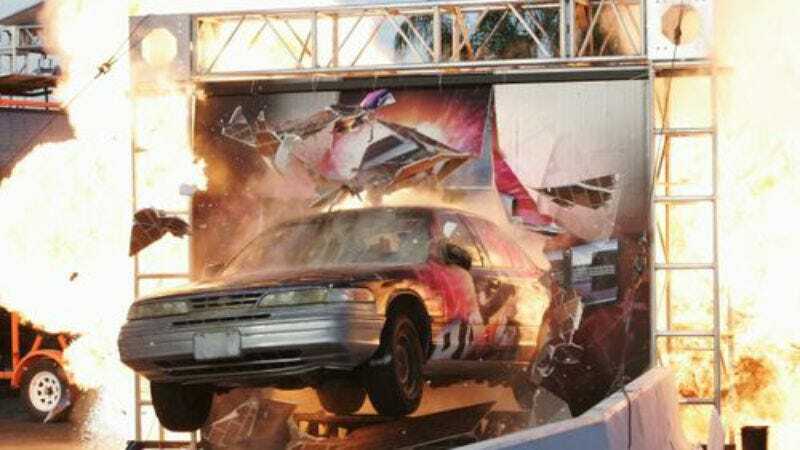 The action of Crash Course is set in Detroit, which is probably a sign that Michigan’s generous Hollywood tax incentives are working really well (between this and Hung) or that the auto industry has just completely given up and decided to show how much better American-made cars can handle things like playing car dominoes or running into giant cardboard rabbits. Curiously, none of this appears to be shot in HD, even though the whole series would probably benefit from the high-gloss sheen provided by the technology. NASCAR races are weirdly mesmerizing in HD, so why couldn’t this be too. If Team Siblings had the weirdness factor and the better-than-everyone-else-at-driving factor going for them, the other teams all kind of blended together into a mass of sniping. Team Married has a wife who rarely compliments her husband (well, whaddaya know?! ), and their unpleasant antics get extended through the entire hour simply due to the fact they keep lucking into advancing in various rounds by the skin of their teeth, leaving more time to ponder how much counseling might help the balance of their relationship. (Obviously, this is likely all a trick of the editing, but as a marginally successful TV critic, it’s my Constitutional right to draw snap judgments about people in reality shows based entirely on the misleading presentation of said people!) Team Roommates has a similarly snipe-y relationship, while Team Single Moms disappears after the first round, even though their swear word substitutions were always amusing (until the one who was asking “Lord Jesus” to come through for them abruptly swore for real – the F word! – when the two were eliminated). Team Best Friends was, I dunno, cocky? The announcers told us to not like them, so I didn’t. The assorted car challenges weren’t too bad. The first one, which involved playing shuffleboard with a moving car, was easily the weakest, but the challenge designed to have the teams drive their car up onto a moving semi trailer as barrels flew at them was pretty cool, as was the final obstacle course, which was pretty well thought out as these things go. I particularly liked the Let’s Make a Deal aspect of having the drivers choose between two garage doors to crash through, each with its own special booby trap behind it. But, again, a lot of the tension in all of this was killed simply because the siblings were so much better than everyone else. Once the tiny clock timing the married couple in comparison to the siblings disappeared from the corner of the screen, it was obvious the siblings were going to crush them. And they did, to the tune of almost a minute. Let’s face it. A show like Crash Course is pretty much critic-proof, which is likely why ABC only put half an episode (and stitched together from two different episodes, no less) up on its press site and made me stay in on a perfectly nice Wednesday to watch it. There’s nothing here so egregiously awful that it should be avoided at all costs, but there’s nothing here that would recommend the show as better than it has any right to be either. And, for what it’s worth, I had a pretty good time zoning out to Crash Course, just as I had a pretty good time zoning out to Nickelodeon’s Sunday afternoon lineup back when I used to visit my grandma on long, lazy summer days in the early ‘90s. But where Wipeout has its own weird brand of insane conviction and Shaq Vs. has the likable Shaq at its center, Crash Course is betting that you’ll just really like to see car crashes. And, yeah, car crashes are awesome. But they can only take you so far. I can honestly say I’ve never coveted a golden steering wheel. I hate it when new reality shows start out by describing their premise and showing footage of episodes yet to come with things that look way more awesome than what we get in the episode we’re actually watching. Car bowling? That would have gotten you a B-, Crash Course. I like Cortese and Jones’ constant assurances that everything going on was completely safe, even when everyone involved is flipping their cars time after time. Further ABC to early ‘90s Nickelodeon comparisons? Comparing Scrubs to Clarissa Explains It All works surprisingly well!